HMMH conducted the noise study for the I-395 Express Lanes Northern Extension Project in support of an Environmental Assessment. The study followed FHWA noise regulations and Virginia Department of Transportation noise policy guidance. The project proposes to convert the two existing HOV lanes to three High Occupancy Tole (HOT) lanes in the I-395 median area north of Edsall Road. 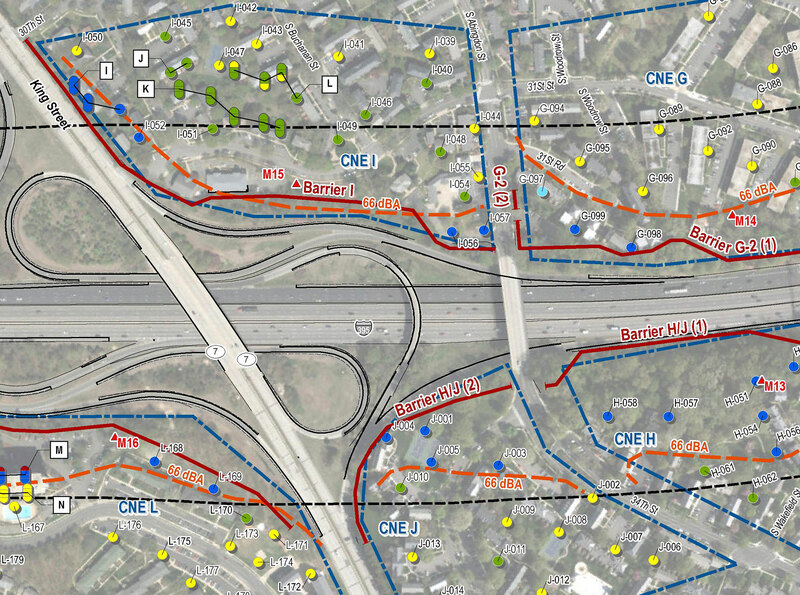 The study area includes extensive single- and multi-family residential property, with nearly 2,300 dwellings currently impacted by noise, and few existing noise barriers. The study included monitoring of existing traffic noise levels, noise model validation, modeling of existing and future year conditions, preliminary noise abatement assessment, reporting, and attendance at public meetings. A total of 2,600 residential dwelling units and 256 recreational receptors were predicted to be exposed to noise impact in the Build Alternative design year of 2040. The noise abatement evaluation found 7.5 miles of noise barriers to be feasible and reasonable, at an estimated total cost of $27 million. These barriers were predicted to benefit (with noticeable noise reduction) 1,850 noise-impacted receptors plus another 2,397 receptors that would not be impacted.